I love the name of this block! I thought I was cutting pieces for three blocks…that was sneaky and magical! 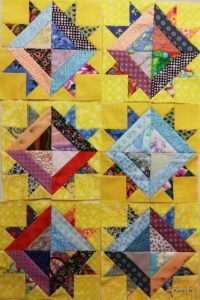 Six blocks and two dozen half-square bonus triangles! And they went together like a charm! Six Noonlights for the draw. Karen N – Cape Town.